Safely Home, the painting by Ron DiCianni pictured here, has special meaning to me. I wrote a novel, also called Safely Home, set in China and telling the story of Li Quan, a modern day martyr. It was inspired by this beautiful work of art. To this day Ron’s painting hangs on my office wall. The painting portrays a man on his knees. His clothing is worn and tattered. He’s just walked down a long strip of blood-red entry carpet that has led him to the foot of a throne. The man’s arms dangle at his sides. He appears both exhausted and relieved, overcome with emotion. His head rests on the chest of one kneeling down to him, holding him tight in a loving embrace. The one hugging him has stepped off the throne. It’s the King, the Creator of the universe, who is also, incredibly, a man. King Jesus. A few feet to the right, open shackles lie on the palace floor. The man had been a prisoner on earth. He’d suffered terribly at the hands of those who despised him because they despised his King. In his right hand, hanging limply to the ground, is a beautiful gold crown. This man is a martyr. He has lived out Revelation 2:10—he’s been faithful unto death, and his Lord has given him the crown of life. He’s one of those who “did not love their lives to the point of death” (Revelation 12:11, CSB). He endured great suffering but is now safely home. Several things strike me in this painting. One is Heaven’s view of earth below. Another is the look on the man’s face, at long last freed from pain and persecution. 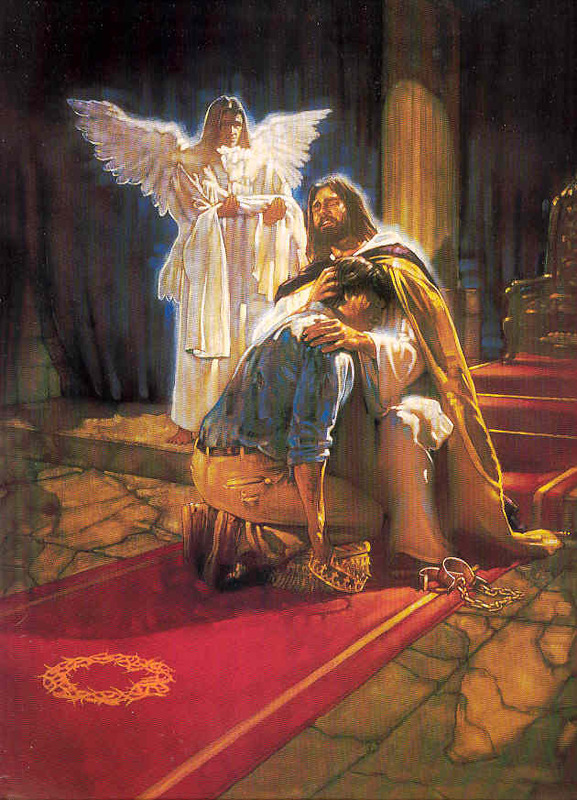 But what really strikes me is the look on the face of King Jesus. He, too, is full of emotion. His face radiates compassion and approval. His nail-scarred hands, drawing the martyr to Himself, are silent testimony to the extent of His love. Many people imagine that though God once suffered on the cross, He’s remote and distant from suffering. Not so! Christ made it clear that to persecute His people is to persecute Him. Whatever others do to His people, He regards as being done to Him (see Matthew 25:40–45). After His ascension, Jesus said to the Pharisee on the Damascus road, “Saul, Saul why do you persecute me?” (Acts 9:4). Persecution, of course, entails suffering. One verse later Christ says to Saul, “I am Jesus, whom you are persecuting.” Note the present tense—although Christ’s atoning sacrifice occurred in the past, He continues to identify with and participate in His people’s suffering until He returns to end all suffering. Thousands of people around the world die for Christ each year, and God knows the story of each one. He knows exactly how many martyrs there will be, and He is prepared to return and set up His Kingdom when the final martyr dies (Revelation 6:11). Though you and I may never die for following Christ, it is certain that each of us will face suffering and heartaches in this life. But we are not alone. Jesus suffered for us, He suffers with us, and our brothers and sisters throughout the world suffer alongside us as we follow our suffering Savior. Christ calls upon us to trust that He’ll work all suffering in our lives for good (Romans 8:28). And He promises that one day on the New Earth, “He will wipe away every tear from their eyes…neither shall there be mourning nor crying nor pain” (Revelation 21:4). When that day comes, and we are at last safely home, we will gaze with wonder at the scars of King Jesus that made our suffering His so that His eternal joy and comfort could become ours. 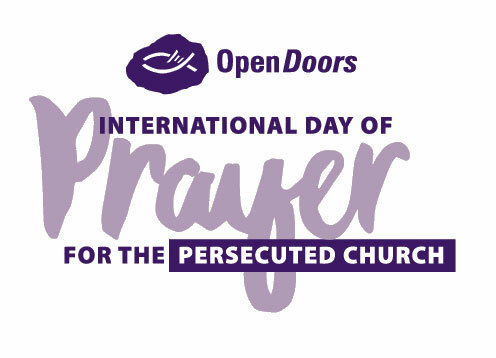 Sunday, November 5, is the International Day of Prayer for the Persecuted Church, a global day of intercession for persecuted Christians worldwide. It’s a day to remember and pray for the hundreds of men, women, and children killed for Christ each day, ignored by the world but watched by the eyes of heaven—those of whom the world is not worthy. Open Doors USA offers free resources, including a video, that individuals and churches can use in observance. You can also give through EPM by donating to our persecuted church fund, and 100% of the donations will be passed on to worthy ministries. Recently a number of reports coming out of China indicate that persecution of Christians is increasing. In my novel Safely Home, while facing martyrdom, Li Quan quotes a poem called “Afraid.” A reader recently asked about the origin of that poem.